You just keep on trying 'til you run out of cake! I would first like to point out that there will be MASSIVE SPOILERS in what comes to follow. I will be detailing my thoughts and experience with this series. I want to feel out what made this game so good, to help explain why the ending fails so horribly for me. For me, Bioware created this amazing, compelling, detailed, and expansive universe in Mass Effect. One that, in my opinion, rivals any created to date. The attention to detail was frankly stunning. Even planet had its nuances described in its lore, if you so chose to read them. While I did not read them all, I appreciate the time and care that must have took. They put care into making subtle references to decisions you made in the previous games, and sometimes not so subtle references. While never perfect, it blended well and really immersed me into the universe. The games themselves challenged you to make decisions. You could certainly ignore them, arbitrarily chose them, or carefully pick them and experiences the consequences great and small. There were times you had to chose the life or death fate of a squad mate and deal with the remorse. There were times when you had to fight morally and ethically about the future and direction of an entire race. You had to wrestle with centuries old conflicts and help work out a resolution, good or bad, or rather paragon or renegade. Through it all, though, my Shepard was stalwart and uncompromising. She (femshep for the win) was a legend, not because she chose to be, but because that was what was needed. She fought knowing it needed to be done, that she could not give up, not just for the sake of herself, but for the sake of everyone. She would hold the line. And then we get to the ending of Mass Effect 3. I do not even know where to start. Throughout the game, it had been building to this final moment. The moment to stop the Reapers from destroying all space faring life in the galaxy, centering, for the moment, on Earth. 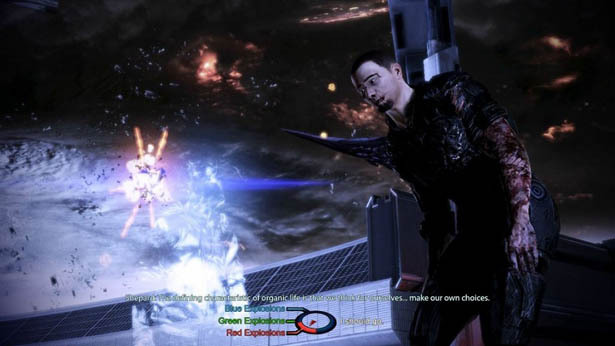 Shepard had gathered all the races in the galaxy together for this one push to retake Earth, and reach the Citadel to complete this final weapon. The galaxy is on the line. Everyone knows this. Everyone is prepared for the worst. Shepard’s core team has been with her through thick and thin. And in those final moments, the most uncharacteristic (for this series) things happen. Shepard is confronted by, in what is possibly the most blatant deus ex machina in existence (I possibly wonder if they wanted everyone to use mass effect as the term instead now). this ghostly, projected, childlike form. This form claims the Citadel is his home, and claims to be the creator of the Reapers. This really does not follow the lore very well. They’ve already stated that the Reapers created the Citadel, and if this form was in control of the Citadel, then how the hell did we stop the Reapers from jumping through it in the first game. The form claims to have created the Reapers to solve the problem of synthetic life forms killing their organic creators. The Reapers entire purpose is to save Organics by killing them, and turning them into synthetics. 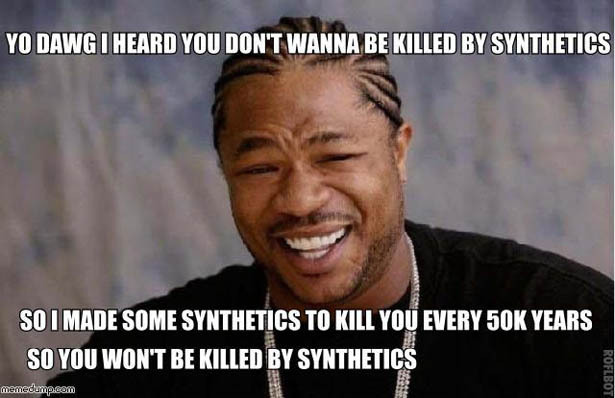 So that Organics won’t make synthetics who will then kill organics. Yes, literally that. Throughout the game, the Reapers had taunted you that their motives were far too complicated for your puny mind to comprehend. Maybe they are right. Though the Reapers themselves are synthetic based and bad guys, the game itself has never been about organic-good, synthetic-bad. It has been, in fact, quite the opposite. In the entire trilogy you deal with and struggle with the good and bad of individuals. Throughout the whole game you fight to gain understand and tolerance. To fight prejudice, with both organics and synthetics. With the mere mention of Legion, there is a bold, recent in-game counterexample to synthetic-bad. Legion, as a synthetic is a voice for the Geth. A voice of reason, and cooperation. The Geth want to co-exist peacefully with organics. The whole conflict with them was, in fact, started because the organic creators were afraid, not because the Geth thought the needed to kill all humans. And then there is EDI and Joker. An AI and human who Shepard helps hook up. As I recall my playthrough I remember a conversation Shepard has with the Reaper on the Quarian homeworld, out of the blue, during the conversation she yelled ORGANICS AND SYNTHETICS CAN LIVE TOGETHER. It was awkward and oddly stated. I didn’t quite get it at the time, but now I think it is a contrived attempt to interject the ending into the game. The tone, and inflection did not match the rest of the dialogue, like it was an after edit. Nor did it fit in with the conversation at all. Its like how I randomly interject candy mountain in conversations for no reason. Just like it. Eventually you are left with three choices (color coded for you pleasure). Where each, essentially, represents the color of explosions the galaxy will face as the mass relays are destroyed and the minimal differences if effect the the choices represent. Throughout all this, Shepard remains silent. No fighting back, nor arguing back. She silently complies with the projections choices. Which is against everything she has done before. Shepard has never taken a lecture like this before. She has argued, clawed, and fought back and every opportunity. But I am expected to believe, that here, she silents obliges to what she has spent the last years organizing the galaxy to fight against? Really? This is character assassination at its worst. With Shepard now successfully the victim of character assassination, we get to some plot holes large enough to drive the Normandy through. The Normandy is seen flying through a mass relay as the explosions of the relay themselves are happening. Why Joker decided to flee, when he has been with Shepard through this all we do not know. They crash (in all three of the colored explosions) on jungle like planet, when out pops your love interest (who also apparently decided to abandon you) and one of your squad mates who was literally just outside the area you were in. When and how did Joker pick them up, reach the relay, and flee in the minutes your conversation was happening? Why would they flee during the most important battle in the galaxy for lifetimes to come? Again, more character assassination. The explosions of the relays themselves are also a glaring hole in the lore. Through the game, it has been establish that destroying a mass relay causes a supernova like explosions that will take out the hosting solar system. So in all cases, in order to you know, help the galaxy, even more of a genocide is about to happen. The destruction of the relays also effectively stops any real galaxy wide travel, so all the fleets in all the galaxy are stranded in the Sol system. One of the endings has the option of merging all organic and synthetic life and the creation of new life (also with a side of destruction of all the mass relays of course). Even in that ending, Joker pops out of the Normandy on that jungle planet, with the only difference being some green glowing eyes and green circuitry glowing skin. If I had to imagine all organic and synthetic life merging into a new collection of life, I just do not really see how everyone is still basically the same, but now with some metal parts. I am slightly curious where EDI organic parts are going to be now. Perhaps the biggest insult of all, though, is the very epilogue like end. One some random world (maybe the jungle world), this child asks her grandfather to tell her more about The Shepard. And then what are you presented with? They have the audacity, after presenting you with that terrible, contrived attempt at an ending, to tell you to buy more DLC. Really? Are you kidding me? I know it is just a game, and people will say Bioware gets to do whatever they want with their story. But Bioware also needs to remember, that the reason they exist is because people like me, who loved the rest of of the game(s), will have the experience totally ruined by their rushed, contrived, and terrible ending. And that we, the consumer, are the reasons they were able to do this as a living. We are their audience. If we trust you, we will continue to support you. But when that trust is lost, it is not so easily regained. Now do I expect a new ending? I’d love one. I’d love an ending where I get to see what the results of my choices were throughout the game. 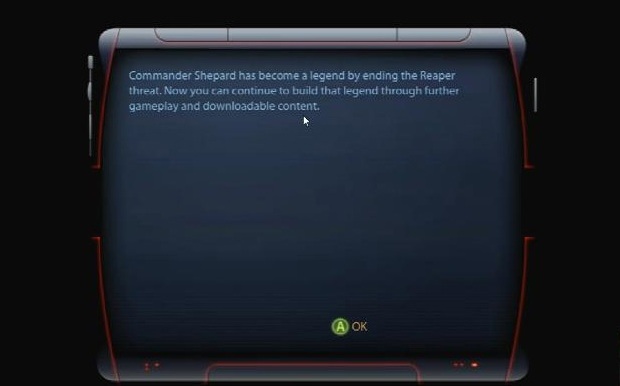 I’d love an ending where Shepard gets some real resolution. I’d love an ending that makes sense, but I doubt it will happen. What would really make be believe in Bioware again is a flat out public apology. Time ran out, money ran out, whatever. Admittance that they screwed up. Without out that, my trust in them as a company is lost. I was already on the edge with the constant phone home requirements of the games themselves. I’ve canceled my SWTOR account (which is a shame) until there is some resolution because I cannot stand by a company that does not respect its audience. As a reminder, what we were promised the game would be. So, how you approach the end-game, for every player, you’re going to have a different set of results in terms of who is alive and who is dead, and which civilizations survived and which ones were wiped out. Whether you’re happy or angry at the ending, know this: it is an ending. BioWare will not do a “Lost” and leave fans with more questions than answers after finishing the game. You’ll get answers to everything. That was one of the key things. Regardless of how we did everything, we had to say, yes, we’re going to provide some answers to these people. This is not how I would describe what I received. There was no closure to the ending. No answers. No resolution. No different results in terms of who is alive and who is dead, and which civilizations survived and which ones were wiped out. Nor does it describe my particular emotion. I was not angry, or happy. I was disappointed, at best. Frustrated, let down, and mislead. Time and money I had spent had been wasted on what seems like a company who forgot who its audience was. We need to remind them, because not only do we deserve better, but Shepard deserves better. A review in far better detail, and far better words than my own that perfectly describes my thoughts (and where I sourced the images I used (I hope they don’t mind)). Two more reviews that describe my frustrations. A nice list of quotes of what was promised as a ending. Really sad how Bioware has lost its way of remarkable story telling.